Each foot has an average of 250,000 eccrine sweat glands that produce about a half a pint of sweat each day, so having slightly wet feet is normal. However, people with plantar hyperhidrosis often experience an overabundance of sweat that may be coupled with a strong odor, a whitish, wet appearance of the feet, and/or frequent foot infections like athlete’s foot and toenail fungus, which can easily invade and flourish on feet that are constantly warm, wet and sweaty. The sweating is even present in low temperatures, which leaves the feet especially cold in the winter months. Many people with plantar hyperhidrosis find that they frequently have to change their socks throughout the day. The cause of hyperhidrosis is currently unknown, but some doctors believe it may be caused by sympathetic (nerve) over-activity, while other doctors believe it is an inherited condition. Excitement and nervousness may make the existing problem worse, as can certain foods and drinks, caffeine and nicotine. Some medical conditions associated with hyperhidrosis include diabetes, Parkinson’s disease, fibromyalgia, congestive heart failure, anxiety, and menopause. 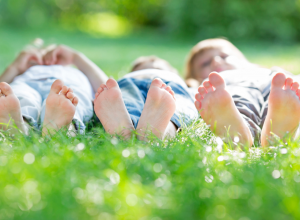 Normally, plantar hyperhidrosis isn’t a serious health issue and can be dealt with at home. Some of the ways patients can reduce the severity of plantar hyperhidrosis include thoroughly washing and drying the feet on a daily basis, wearing breathable shoes and socks on a rotating schedule so the same pair is never worn twice in a row, using antiperspirant and/or foot powder on the soles of the feet, going barefoot when possible so the feet have a chance to breathe, and using non prescription topical agents like Drysol or Odaban (which can be found in pharmacies). For severe cases of plantar and palmar hyperhydrosis, higher strength aluminum chloride antiperspirants can be tried. Iontophoresis, a procedure in which you place your feet in a bath of water that tiny electrical currents are passing through. The treatment is time consuming, slightly uncomfortable and difficult to obtain, which can turn some people off from trying the method. Injections of botulinum toxin (botox), which can be administered to help temporarily reduce foot sweating. Botox works by interfering with the signals your nerves send to your sweat glands. The procedure typically involves about 30 small injections and lasts a couple of months. Anticholinergic drugs, which help excessive sweating by blocking the nerves responsible for sending signals to your sweat glands. However, they come with quite serious side effects including blurred vision, constipation, drying of the mouth and sedation. Sympathectomy operation, which permanently destroys the nerves responsible for foot sweat. A sympathectomy is the least recommended option, as it is irreversible and has been known to lead to other problems including excessive sweating in other areas of the body, collapsed lungs and Horner’s syndrome, which is a nerve injury that leads to drooping eyelids and trouble with the pupils of the eye. Though the above procedures are available, many experts and sits like Medline, WedMD and MedicineNet agree that they should be used as a last resort. Not only do they come with serious side effects, they may actually exacerbate the existing sweating problem. Learn the common causes of stinky feet and remedies that quickly help clear up the embarrassing condition. Look to your feet to find out if you're over stressed. 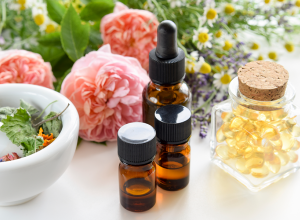 Find out which essential oils are best for helping common foot ailments. A new lotion promises to end foot sweat. Banish nasty foot problems once and for all.